We provide the best event hire and outside catering in Hampshire. We offer lamb roasts for weddings, birthdays and corporate events. We provide a tailor-made personal service to suit each occasion, this will include a confirmation letter that has all the details of your booking, our arrival time for your event and option for payment. Followed by a site visit to firstly meet new clients but also to do a risk assessment where we look at the size of the site, access and parking for our truck & trailer, the position of the fire, we will discuss where the carving will be done on the day of the event. Plus check for a water and electricity supply, which if there is none we can also supply these. Plus whether you have your own supply of wood or need us to include and deliver wood for your event. If you are unsure about the size of you area we are always happy to carry out a site visit prior to any confirmation of booking to put your mind at rest. For over 25 years, we’ve been providing event hire and outside catering in Hampshire. On the day of your event, we will be at your home, or venue between eight and nine hours before you want to eat to allow time for setting up the equipment, building and lighting the fire, preparation, and depending on the number of lamb either one or two hours carving. The lamb roast is slow cooked beside the wood fire for five hours, continuously turning and being basted all the time it is cooking. This means it becomes very lean yet remain moist with a very unique flavour. We bring everything we need with us including a stainless steel table and carving tray large enough for the whole lamb, Chafing dishes to carve the meat into so it remains hot until it is ready for your guests to enjoy ! We also work very closely with a number of other Catering companies in different counties to be able to offer a selection of other dishes to accompany our roast lamb, so if you are looking to have canapés and drinks to begin with, and would like green leaf salads, couscous, coleslaw, mixed bean salad, baby tomatoes, soft white rolls etc, to go with our lamb we can recommend some very good companies for this. 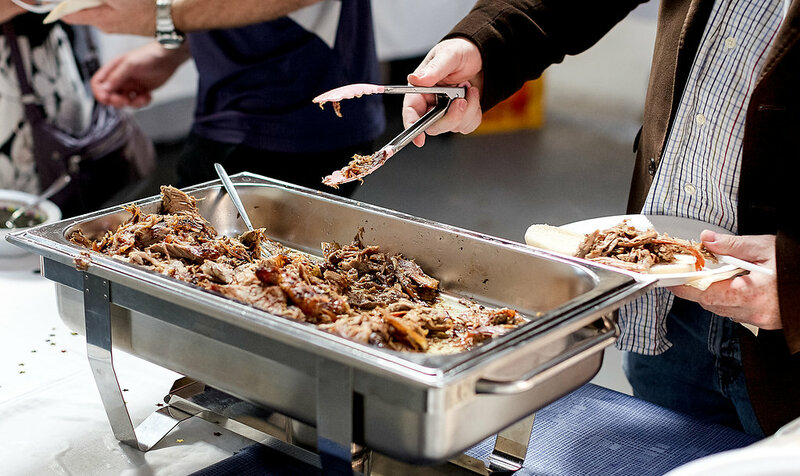 We are also able to offer you spit roast lamb cooked offsite! If your home or venue is not suitable for us to cook onsite, should there not be enough room, you are using a venue that does not allow our fire etc. We will cook your lamb for you at our home address! This will then be delivered to you already carved in a stainless steel chafing dish for your guest to enjoy. We are based in near Petworth, West Sussex. The map below shows a guide area in which we are able to offer this! If you are just outside of the area but are interested in this option give us a call and we can discuss this with you. We can vary the weight of the lambs when we are ordering from a small 15Kg lamb to a large 25Kg lamb which allows us to offer the following options. A single lamb roast for 30 to 75 guests. A double lamb roast for 75 to 150 guests. *But this can only be done for an evening event due to the length of cooking time required for three lambs. The cost of the lambs and wood needed to cook,our service charge which includes travelling expenses, all pre-meetings with you at your venue, collection of the lambs from our supplier, preparation and securing them onto the spits, and delivery of the wood before your event. Setting up the equipment on the day, cooking and carving the lambs, and the supply of chafing dishes to keep the meat hot after carving and before either being put out for a buffet, or passed onto other caterers for service. And of course mint sauce if it has been requested ! Weddings, Christenings, Anniversaries, Birthdays etc. Themed events including Moroccan & Medieval. Corporate team building and training days. Halloween, Bonfire & New Year Events.